I’ll confess — while I do enjoy pistachio and roses separately — I would be a little nervous to put them together. Which is why I was intrigued but wary when the kind folks at Tea Horse sent me a sample of their Pistachio Rose tea. After a few sips, my concerns were quickly put to rest. This is a unique and very lovely tea. While it technically fits in the green tea category, it’s so incredibly different. 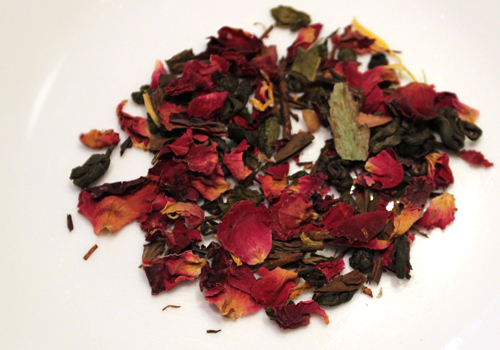 A special Tea Horse blend of green tea with rose petals, pistachio, Hojicha, rooibos, calendula petals, sunflower petals, almond slices, mallow flowers and vanilla. The green tea is grown in Yunnan, China and Hojicha, roasted green tea, is from Japan. Rooibos is grown in the wilds of South Africa’s Western Cape and the pistachios are from the Middle East. The flavour is best using two heaped teaspoons and water cooled for five minutes to 75C (167F). Infuse for one minute only. The Pistachio Rose blend has a striking physical and aromatic resemblance to a pretty potpourri rather than tea leaves meant to be steeped. The tea leaves are liberally scattered with bright flower petals, offset by the dark green tea leaves and yellow-brown scatterings of flowers and almond. The blend is intensely aromatic, flowery and complex. Below is a close-up of the pretty tea leaves. Despite the short 1-minute tea, the resulting tea is a clear caramel and well-flavored, not at all weak. The taste of the tea is creamy and full-bodied, with a nutty base that fades into a lingering vanilla aftertaste. Despite the heavy floral scent of the dry leaves, it’s well-balanced and not at all overpowering. It’s fresh and refreshing. It’s not a tea that I would have chosen off the shelf, but what a surprise. This one is truly unique and I enjoyed my cup. Find more information about this tea at on Tea Horse site.